Also present: Holly Parsons, Rosemary, Bethan. 00.05 – Andrea: What was your sister’s bear like? Bernard: Conventional type of bear. Not the German variety that’s very expensive. But a conventional type. Andrea: Did you ever want to play with it? Or was it just your sister’s? Bernard: We played with it together. Andrea: So what was her bear like? Bernard: It was fluffy. A constant colour. Light brown. I can’t tell you anything else really. It had nails. Eyes of course, the glass eyes I think. I can’t remember anything else about it. Andrea: Can you remember how you played with it? Bernard: Yes. We pushed it in each other’s faces and things like that. Bernard: And generally larked around. But a very serious time of course, during the war. Bernard: The, one of the greatest Christmas presents I received when I was comparatively young, was a train that was built by, well it was designed and built by my father. And they used cotton reels for the wheels. He used cotton reels for the wheels. And he did a good job. And I was ever so proud of that. The fact that things were desperately short, money was desperately short, and he actually worked on that in his spare moments, prior to going in the forces. And that’s my favourite toy type memory. I remember that with a lot of, a lot of love in my heart and things like that. Doreen: Oh I had a doll. Doreen: It was a second hand doll. Doreen: But I liked it. It was china and she had, it was a she, she had a set of clothes that I could change for her. But it was given to me, it wasn’t bought, because my mum was poor, couldn’t afford things like that. But I used to love that. John: Have you still got it? Doreen: No. Unfortunately. I don’t … I think it got lost during the war. As so many things did. Yes, yes. But I ofttimes wonder where it did go. I would have loved to have had it. But it wasn’t to be. Andrea: How big was it? Doreen: Oh it was only, about that big [gestures – c.18”]. What do they call them, baby doll sort of thing. Yes, It was only small. But I liked it very much. Doreen: I did, because I had also a little run down pram, that was very run down actually, so I used to take it for walks. Doreen: [laughs] yes, we done a lot of walking, I think that was our pastime really, walking, but it’s funny actually, talking like this, it brings things back. John: Yeah, it was a great toy that was. I think most of us had Meccano didn’t we? Andrea: I think so. What did you make with it? John: Cranes, trucks. You got the instruction kit with it as well. Very good they were. Andrea: You said you had the instruction kit. Did you use to follow the instructions and . . .
John: Not very often, no. You used to make your own things out of them. Yeah, you had motors and everything on them. Yeah, a brilliant toy. Winders. On the crane, up and down. Yeah, a very good toy that was. Used to spend hours and hours with it. John: Yeah. Four wheels that you’d got off a pram somewhere. Put a plank on ‘em. A box for a seat. Andrea: Did they have brakes? John: No, there was hardly any traffic then was there? No parked cars everywhere. No parked cars. Bernard: I can remember being run over by a car when I was about five years old. Doreen: Yeah, I remember being knocked over by a car. Bernard: It was a rarity anyway to see a car. John: You were run over was you? 00.04 Andrea: So I’m going to start with Doreen. Doreen, when were you born? Doreen: When was I born? Andrea: And where was that? Doreen: That was in Bexhill. Or Sidley actually. Doreen: Sidley is a little suburb of Bexhill. Really. Andrea: Okay, thank you. And Bernard? Bernard: I was born in Burgess Hill. Cyprus Road in Burgess Hill. On the 6th August 1934. Andrea: Thank you. And John. John: I was born in Claremont Road Brighton, 1934. Andrea: 1934. Thank you very much. John: So we’re the same age then. We’re both 47. Bernard: Yeah, in your dreams. 00.51 – Andrea: If only. As I said to you back in the room, the project’s focussing mainly on memories of dolls, bears and construction toys, and I’m guessing that some of you may have more memories about some of those than others. But I’m going to start by asking about teddy bears. Do any of you remember having a teddy bear when you were young? Bernard: I can remember my sister having one, but not myself. Andrea: Okay. Did you want one, or? Bernard: No. I mean it just wasn’t available, so I didn’t have one. Andrea: But your sister had one? Bernard: My sister had one, yes. Andrea: What was your sister’s bear like? Andrea: Of course. So it wasn’t a very sedate bear then. It didn’t sort of sit there having tea parties. Bernard: well, all sorts of imaginary things like that. Tea parties and my sister had a little tea service I seem to remember. I’ll briefly explain to you. My mother died when I was born. Consequently my father remarried five years later. And eventually along comes Margaret. The greatest thing in life as far as I was concerned was the fact that I’d actually saved up for Margaret and the doctor wouldn’t take the money when she arrived. And I was more than a little peeved to say the least that he wouldn’t accept the money for my sister. Andrea: Absolutely. I like that. So what did you do with the money? Bernard: I don’t know to be honest with you. I have no memory of that. I’ve no idea. Something about toys. Can I go on? Andrea: Of course. Go for it. 03.59 – Bernard: The, one of the greatest Christmas presents I received when I was comparatively young, was a train that was built by, well it was designed and built by my father. And they used cotton reels for the wheels. He used cotton reels for the wheels. And he did a good job. And I was ever so proud of that. The fact that things were desperately short, money was desperately short, and he actually worked on that in his spare moments, prior to going in the forces. And that’s my favourite toy type memory. I remember that with a lot of, a lot of love in my heart and things like that. Andrea: I think especially when people have made things for you, it’s the act of it being made for you isn’t it? Bernard: Funnily enough, we were only talking about that to my grandsons this week. My younger grandson, who remembered mew making a garage for him and the fact that this garage had a ramp and it was on two levels and things like that. He remembers incredibly, and he remembers right back to the age of two. Which I think is quite incredible. I have no memories other than those at five years old. Perhaps I’m a dim person. Andrea: I think people vary don’t they? What the first thing they can remember is. Some people remember learning to crawl. But I think most people don’t. Most people might remember being a child but not being really really little. Bernard: My grandson can remember toys that in his sense that he liked particular toys. He liked lorries and things like that. And they started building an addition to the existing estate near us and so every morning that we had him he loved to go up to see what the builders were doing. And he used to, it used to amuse me because he used to say ‘lorry, lorry. And then they started the JCB and he wanted to go. 06.37 – Andrea: So we’ve checked with you about teddy bears. What about dolls? Did anyone have any dolls? John: Haver you still got it? Doreen: yes, yes. I think I had quite an ordinary life you know, but, same as everybody else. At least I thought it was the same as everybody else. Probably wasn’t. Andrea: Did you play with this doll on your own or with other people? Doreen: Oh, it was, I can’t really remember. I think, mostly by myself. Because we didn’t have any special place that we could go to, you know for dolls and things. So I think, just thinking about it now, I played with it by myself, yes. Doreen: Yes, that’s right. And talking to her. Doreen: Yes. As one does. Andrea: Do you remember if she had a name? Doreen: I think she did, but I can’t really remember what it was. I have a feeling I used to change it quite often [laughs]. Yes, it was quite good really. 09.51 – Andrea: Lovely, thank you. So thinking about construction toys, did anyone have construction toys, things you make things out of? Andrea: What colour was it? Andrea: The green and red one. John: Yeah, we had loads of it. And we used to spend hours and hours making things, saving bits, starting again. Yeah. Very nice. Andrea: You say ‘we’ so did you play with . . .
John: No, I meant me. I had two sisters. Andrea: Ah. And they didn’t play with the Meccano? John: No, they didn’t play with the Meccano. Andrea: Did they not want to? Andrea: Would you have let them if they had? Andrea: So when you’d made things out of Meccano did you – well you’ve just said you wound the crane up and down – so you then played with whatever you’d made? John: played with it for a while and then took it to bits again and made something else. I suppose Lego’s the equivalent these days. You don’t see much Meccano about, do you? Or do you? Andrea: No., You see a bit, it’s still about. John: It’s probably plastic now isn’t it? John: ‘Cos it use to be metal didn’t it? All metal. Andrea: Yeah, the plastic Meccano’s not so good. John: hundreds and hundreds of nut and bolts. They used to go everywhere. John: the little screwdrivers, that’s right. Yeah, it was a good toy that was. They still make it do they? Only in plastic? Andrea: They still make it in metal as well, they make it in both. I don’t think it’s as popular as it used to be. John: No, no, well it’s too much. Too many of these video games and toys about now. I think a lot of toys have gone now. So you’ve got a record of them all in the toy museum? Andrea: We have. We’ve got a lot of Meccano.in the toy museum. 12.38 – John: Where is the toy museum? Bernard: Oh I’m with you, yeah. Top of Trafalgar Street. Andrea: Top of Trafalgar Street, yeah. In the arches under there. John: You’ve got lots of Meccano have you? Andrea: We’ve got a whole cabinet full of Meccano. Andrea: All made up, yeah. John: Have you? I’d like to see that, yeah. Andrea: Crane. Windmill. Big Ferris Wheel. John: You open all day? Andrea: We’re open Tuesdays to Saturdays. So pop in, it’ll be nice. John: Nine till five or something? John: Yeah that’s good. Worth a look round. 13.25 – Andrea: So Doreen, did you have Meccano? Doreen: I can’t remember having it, no. But whether I did or not I don’t know. But I did have an older brother, so whether he had. I mean, my mum was rather poor because my dad died when I was a year old, so there wasn’t a lot of money for buying things like Meccano. Andrea: No. Meccano wasn’t cheap was it? John: Mine was all second hand anyway. You know, swapped it for comics and stuff like that. Build it all up. Couldn’t afford to buy it. Think my dad brought it home to start with, a box full and we just added to it. Yeah. Yeah, they was no money around in those days at all. 14.16 – Andrea: No. Did you – especially thinking about growing up at a time when there wasn’t much money, you probably didn’t have many toys, did you make your own toys in that sense of sort of like constructing things? Were there things you made for yourselves? John: We used to make four wheelers. With pram wheels and a plank. Run them down the road. That sort of thing, yeah. 14.43 – Bernard: I can remember having – quite vividly, having a small section in the garden, a vegetable plot. Well, I sowed my own carrots and potatoes and whathaveyou. But, just a tiny section. That was quite something, to have produced yourself. It was rather good fun. Bernard: And then later in life, sort of late, early years and into the teens, football became the order of the day and I played an awful lot of football. And then it went further than that because I then took up tennis, and I played tennis for years, all the year long, out in the outside courts, hard courts they were. And we played quite continuously. You know, every weekend or something. And later in the evenings and things like that. But generally I got ordered home at about eight o clock in the evening to go to bed because I had to get up to do my paper round the next day. And write eight others. John: Did you play cricket with home made stumps and bats? 16.22 – Andrea: So you were saying about the four wheelers. So pram wheels, bits of wood, planks. 16.58 – Bernard: I can remember being run over by a car when I was about five years old. Doreen: Yeah, I remember being knocked over by a car. Bernard: It was a rarity anyway to see a car. John: Running away from a girl? Bernard: Yes, indeed. I didn’t like here at all. And I ran straight into an oncoming car. Which was, as you say, an absolute rarity, to see a car. Bernard: It had two men. Bernard: One with the red and one with the green. 17.53 – John: Kite flying was good too. John: Make your own kites. And then we used to make these, a stick with flight feathers on it, wind a bit of string round it and throw it, they were very very dangerous they was. They’d kill you if they hit you. Andrea: What did you throw it at? Andrea: What did you throw them at? Targets, or . . .
Andrea: rather than ones you bought. John: I mean it wouldn’t be allowed today, it was too dangerous that sort of thing. But yeah . . .
Andrea: Okay, brilliant. I’m going to say thank you very much. I really enjoyed that. Andrea: So I’m going to start with Doreen. Doreen, when were you born? 00.48 – Andrea: If only. As I said to you back in the room, the project’s focussing mainly on memories of dolls, bears and construction toys, and I’m guessing that some of you may have more memories about some of those than others. But I’m going to start by asking about teddy bears. Do any of you remember having a teddy bear when you were young? 03.56 – Bernard: The, one of the greatest Christmas presents I received when I was comparatively young, was a train that was built by, well it was designed and built by my father. And they used cotton reels for the wheels. He used cotton reels for the wheels. And he did a good job. And I was ever so proud of that. The fact that things were desperately short, money was desperately short, and he actually worked on that in his spare moments, prior to going in the forces. And that’s my favourite toy type memory. I remember that with a lot of, a lot of love in my heart and things like that. 06.34 – Andrea: So we’ve checked with you about teddy bears. What about dolls? Did anyone have any dolls? 09.48 – Andrea: Lovely, thank you. So thinking about construction toys, did anyone have construction toys, things you make things out of? 12.35 – John: Where is the toy museum? 13.20 – Andrea: So Doreen, did you have Meccano? 14.10 – Andrea: No. Did you – especially thinking about growing up at a time when there wasn’t much money, you probably didn’t have many toys, did you make your own toys in that sense of sort of like constructing things? Were there things you made for yourselves? Bernard: I can remember having – quite vividly, having a small section in the garden, a vegetable plot. Well, I sowed my own carrots and potatoes and whathaveyou. But, just a tiny section. That was quite something, to have produced yourself. It was rather good fun. Andrea: So you were saying about the four wheelers. So pram wheels, bits of wood, planks. 16.54 – Bernard: I can remember being run over by a car when I was about five years old. 17.49 – John: Kite flying was good too. 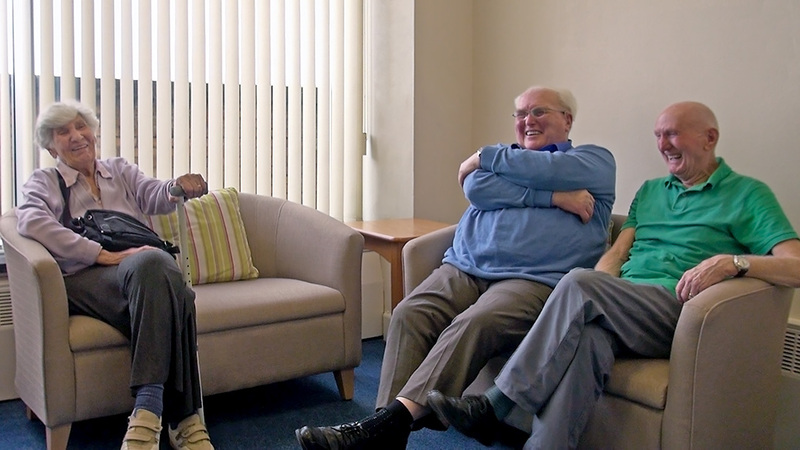 Doreen, Bernard and John are members of the art and craft workshop at Blind Veterans UK, Brighton. Doreen (on left in photograph) was born in Bexhill in 1927. Bernard (in centre in photograph) was born in Burgess Hill in 1934. John (on right in photograph) was born in Brighton in 1934. In the short version (5m 21s) of their interview they discuss teddy bears, handmade toys and Meccano. In the full version (18m 50s) they also reflect on second hand toys and outdoor play, including football and making go carts and kites.